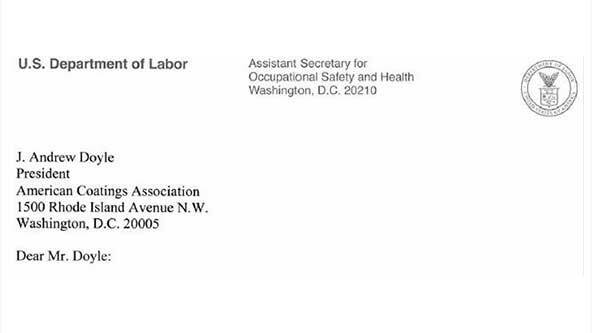 According to a letter addressed to the American Coatings Association, OSHA has stated that it is willing to use its enforcement discretion to determine whether chemical manufacturers have made a good faith effort to obtain information necessary to comply with the June 1, 2015 chemical reclassification and safety data sheet authoring deadline. The deadline is a key milestone in OSHA's recent revision of its Hazard Communication Standard (HazCom) to align with the Globally Harmonized Standard (GHS). By June 1, 2015 chemical manufacturers are supposed to use GHS criteria to classify the health and physical hazards of the chemicals they produce, and then create new labels and safety data sheets in the GHS format for downstream users. However, some chemical blenders, those companies that use chemicals from upstream suppliers to create their own mixtures, are having trouble meeting the compliance deadline since they are waiting on upstream suppliers to complete their own re-classifications. Many formulators know they will already be unable to meet the June 1, 2015 deadline, and now, thanks in large part to an effort by industry associations like the American Coatings Association, it looks like they will get some relief if they are unable to meet the classification and authoring deadline. Essentially OSHA is saying if a chemical manufacturer has documented its reasonable efforts to obtain the proper information through alternative efforts, such as contacting their suppliers, searching for alternative suppliers, or trying to find the relevant information on their own - then the agency is willing to take that into consideration from a compliance enforcement perspective. It's important to note, OSHA has not altered the June 1, 2015 deadline, and most companies are still expected to be in compliance by that date. Companies unable to meet the deadline will have to prove they made an effort to comply, but were logistically unable due to supply chain constraints. A copy of the letter is posted below. If you need assistance with your chemical classification and authoring of GHS formatted safety data sheets and labels - MSDSonline's certified SDS authoring professionals stand ready to assist you.